Welcome! Specializing in everything with emphasis on Radios, music items, glassware, pottery, toys, dolls, paper items, jewelry, kitchenware, advertising memorabilia. 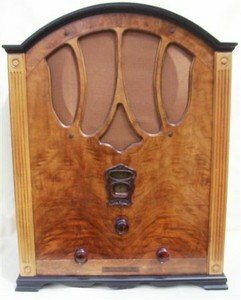 We bring to you 50 years experience in the radio business and 30 years experence in antique business. We are now exclusively on line shop with a major emphasis on Radio and radio items. Feel free to request photos, be sure to specify item number (s) in your request. We accept money orders, cashier checks, personal checks. All funds must be in us dollars and payable to Herman Schnur. Items paid for by personal checks will be held until check clears. Others will be shipped immediately. Customer pays actual cost of shipment and insurance, a small charge for boxes and packing material. You may return any item within 5 days of receipt (you must notify us of pending return within 48 hours of receipt) we will cheerfully refund purchase price excluding shipping cost. Return within 5 days after authorization with sticker/stamp intack. Relax, enjoy, and thank you for visiting with us.